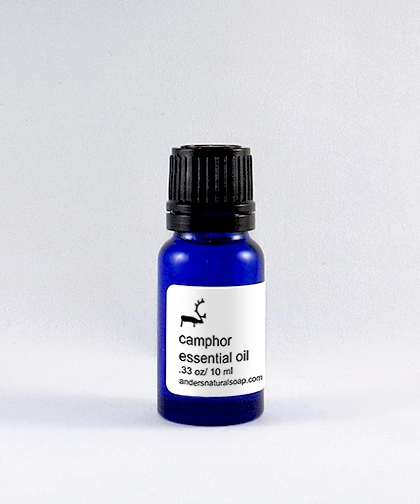 CAMPHOR: Anti-inflammatory: Camphor essential oil is anti-inflammatory. It leaves a cooling effect that is very effective in relieving pain. It is also used to suppress the pain caused due to neuralgia by contracting the blood vessels and easing the pressure on the cranial nerve. Anesthetic: Camphor oil has the property to numb the sensory nerves in the skin and hence can be used as a temporary anesthetic. Using the oil can offer relief from pain caused due to insect bites, mild burns or skin irritation. We use a small amount of Camphor essential oil in our Medicated lip balm, but it does make for a great ingredient to add to this formulation to aid in the relief of painful dry lips in cold winter weather.